Stylists work to help female CrossFit athletes conquer their fear of denim and find the perfect pair of jeans. Spandex is great, but sometimes a lady wants to rock a pair of jeans. The squatting in CrossFit is known for developing a well-shaped rear, so it seems a shame to subject that booty to a pair of ill-fitting jeans. As with any problem, the best thing to do is go to the experts for advice. In the quest for quality denim that fits the CrossFit body, the CrossFit Journal gathered three top athletes: six-time CrossFit Games competitor Becca Voigt, rising star and former USC basketball player Jamie Hagiya, and two-time SoCal Regional competitor Pam Eamranond. The women met at The Blues Jean Bar in Santa Monica, Calif. The store specializes in fitting denim, and instead of wandering confused through the racks, you belly up to the bar and tell the “jeanstender” what style you like and the size you typically wear. The stylists look at the wall of denim behind them and pick some options. They don’t stop until they find a pair of jeans perfect for you. But were they up for the challenge of fitting the CrossFit body? Hilary Achauer was tired of headbands that came off in the middle of a WOD, so she went in search of the perfect headband for CrossFit. Lauren Lesinski’s weight-loss story was one of the CrossFit Journal’s most recommended stories in 2011. We caught up with Lesinksi to find out how she’s doing one a year later. What does it take to write a book? Hilary Achauer talks to Samir Chopra and bestselling novelist Eleanor Brown about the joy—and pain—of writing. 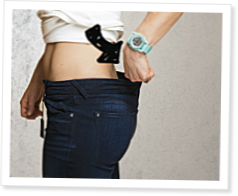 I am a swimwear designer but I have been approached by several crossfitter`s with requests for custom denim jeans. So far I have made two pair. Both were for men with large muscular thighs and smaller waists. On both I had to create a pattern from scratch because conventional patterns are completely inadequate in the thigh for many C.F. men. I researched the average thigh size for men in our gym and a sampling showed that the average thigh size for men would just barely fit into most jeans. Large or XL thighs will really struggle to find good fitting jeans..I'm looking into changing all of that!